This sublime sandstone wilderness has inspired half a dozen painting trips over more than a decade. The slot canyons, washes, mesas and arches provide endless subject matter. Most of the paintings shown here were painted onsite. Besides the work shown here, many additional paintings are available. Regions covered include Grand Staircase - Escalante National Monument, Capitol Reef National Park, Bears Ears National Monument, and the unprotected wild lands around Hanksville, the Fremont and Dirty Devil Rivers. 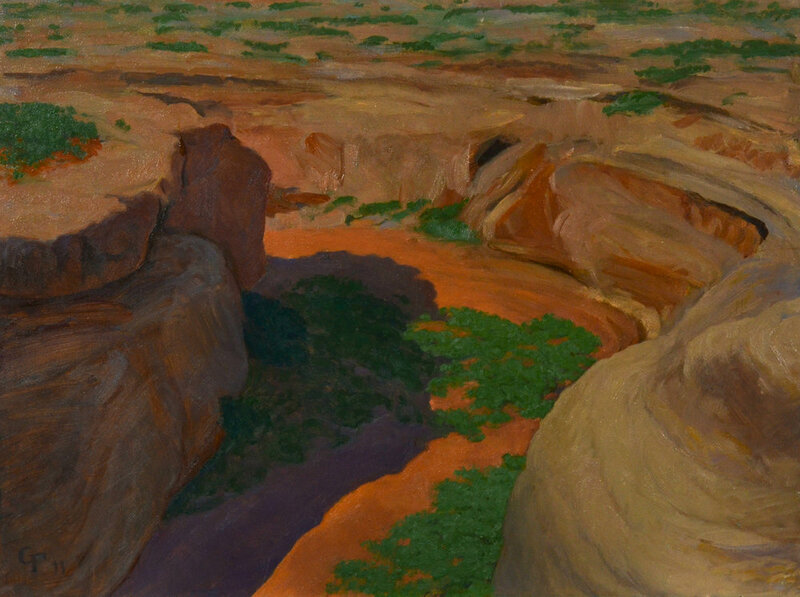 Hog Springs, oil on panel, 12" x 9"
Long Canyon Spire, oil on panel 12" X 9"
White Canyon, oil on panel 9" X 12"
Henry Mountains, oil on panel 11" X 14"
Escalante River, oil on panel 9" X 12"
Broken Bow Arch, oil on panel 9" X 12"
Long Canyon, oil on panel 9" X 12"
Harris Wash, oil on panel 9" X 12"
Dirty Devil River, oil on panel 9" X 12"
Early Weed Bench, oil on panel 9" X 12"
Sunset Arch, oil on panel 9" X 12"Sunset Arch, oil on panel 9" x 12"
Fremont River, oil on canvas 9" X 12"
Factory Butte, oil on panel 9" X 12"